How much is your time really worth? Is it worth Â£50 an hour or Â£100 an hour? YOUR time is most valuable because it is your responsibility to generate new revenue for your business. Doing small and often trivial admin chores yourself does not really add value to your business and the sensible solution is to delegate those less profitable tasks by hiring someone more than capable of carrying them out, but whoâ€™s hourly rate is somewhat less than your real financial worth. So whatâ€™s stopping you? Wouldnâ€™t it be perfect if you had an assistant that was always ready to work for you, but only when you need them? Working from their own home or office, using their own equipment? Meet the Virtual Assistant (VA), an invaluable new work force that provides a practical solution for small businesses owners. A VA frees up your valuable time so you can concentrate on the important things that only you can do in your business. Because your VA is self-employed, and invoices you only for the actual hours worked or by tasks completed, and is dependent on referrals and steady work flow from existing clients, s/he can be the perfect solution for a busy small business or entrepreneur. When you hire a VA you get all the benefits of outsourcing – no employer liabilities, tax and benefits issues, coupled with the loyalty and steadiness of a company employee. With a VA, you have someone to whom you can delegate. Your VA can return telephone calls, answer e-mails, and draft letters for you. They can take your telephone calls, filter your email, deal with your post, book your doctors appointment and even remind you of your wifeâ€™s or mothers birthday and source the perfect gift if necessary! VAâ€™s are already computer trained, and can assist with your specific needs from traditional office support services to highly specialised areas including web page design. You can also equip your VA to go beyond administrative support to client development and marketing support. You can easily justify a virtual assistant in terms of your greater productivity and your greater efficiency. You need to be the leader in your business and your VA will insure that you focus on what is important, rather than urgent. Your VA can also lend â€œsizeâ€ to your company, which will impress potential clients. As more and more businesses move their marketing and communications to the Internet, VAâ€™s are becoming the obvious solution to staffing issues. For an hourly fee often less than the cost of temps or the real cost of employees, businesses can take advantage of professional assistance and a variety of skills at the click of a mouse. 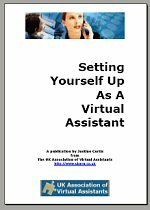 Resources: Justine Curtis is the founder of My Virtual Assistant, a virtual office service operating across the UK, providing virtual office support, personal assistance, secretarial services and administration services remotely from its UK based office. For more information about Virtual Assistants visit http://www.my-va.com/.